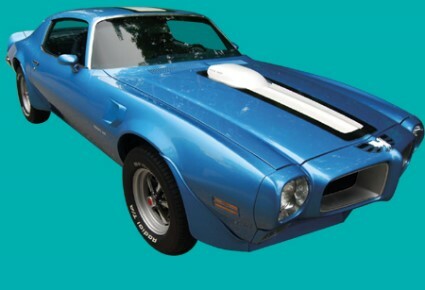 1970, 1971 and 1972 Pontiac Firebird Trans Am ushered in the now infamous second generation Firebird. 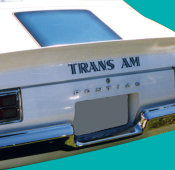 During these years the Trans Am was only offered in two colors; White or Blue. The white car continued the theme of the first generation 1969 in that it carried blue striping. The Lucerne Blue cars carried white stripes. This premium kit is manufactured to exacting OEM standards. Exact in every way the wide white stripe kit has the black border and fine black pinstripe around the perimeter. The wide blue stripe kit has the finely detailed black dot fade pattern that fades from outside toward the center and also includes the fine black pinstripe around the perimeter. These Firebird Trans Am now command their highest price ever and we have implemented 21st century production standards to this project. New state-of-the-art inks, clear-coat, vinyl and die cutting is used to provide you a product of unparalleled quality.